Dicing technique and ingredients for the Chorizo and Veggie Hashes. Note that we don’t mention chemicals or preservatives, because we don’t add them, ever! Just spices, fresh smoked meats and veggies. And flavor. We put in plenty of flavor, too. 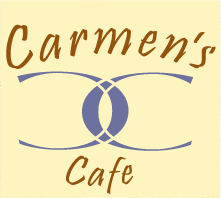 This entry was posted in Welcome to Carmen's Bistro and tagged bistro, cafe, Chef, chorizo, cooking, Cuban, food, hash, how to, recipe, restaurant, spanish restaurants, Tapas specials, tasty, vegan, vegetarian, Veggie. Bookmark the permalink.